According the World Health Organization, the incidence of and fatalities from poisoning have increased drastically in recent years from 346,000 people around the world in 2004. However, research & development in medicine and increasing knowledge about pharmacokinetics has led to the discovery and development of numerous antidotes for most poisons around the world. Globally, development of efficient and advance technology, stringent government regulations, rising awareness regarding the importance of antidotes among common people as well as healthcare providers, growing initiatives of community education, and higher suicide rate in the low-income nations of Africa are the prime growth drivers of global poisoning treatment market. 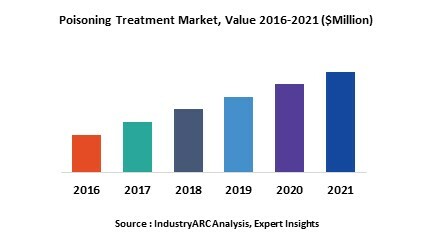 In addition, increase in adoption of poisoning treatment in emerging economies such as China, India and others, will create new opportunities for global poisoning treatment market. However, higher cost of the research and development, and complex government approval processes are the key restraints for global poisoning treatment market. Geographically North America dominated global poisoning treatment market because of availability of new and effective antidote, high medical reimbursement facilities, and technological advancement through focus on research activities. Asia Pacific is projected to have fastest growth, owing to rapidly increasing availability of antidote, rise in consumer awareness, favourable government policies, rising pharmaceutical industry, and modernization of healthcare infrastructure in developing nations such as China, and India in this region. This report identifies the global poisoning treatment market size in for the year 2014-2016, and forecast of the same for year 2021. It also highlights the market drivers, restraints, growth indicators, challenges, and other key aspects with respect to global poisoning treatment market. 13.3. Meridian Medical Technologies, Inc.
13.10. Merck & Co., Inc.